The old saying goes " No news is good news" but we disagree, we love to hear good news and especially heart warming rehoming stories. 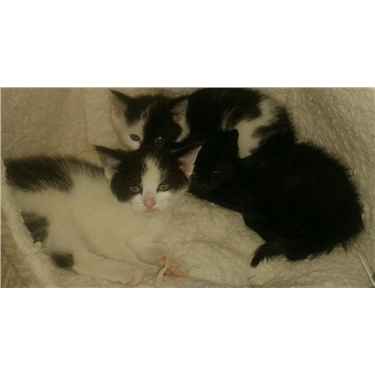 Murphy, Molly & Welly came to us at 6 weeks old having been found in someones garden, and to say they weren't exactly pleased to be in the warmth and comfort of their new home is an understatement. But our fosterers are not put off that easily and believe thet behind every "hissy and spitty" feral kitten there is a lovely playful kitten just waiting to be found. After 8 weeks of patient reassurance, lots of TLC and gradual socialisation (using all the normal techniques and some new ones), all three have all now been successfully rehomed. Welly has joined two older cats in a lovely rural home and I am sure he will be truly spolit. "Hi Just a quick update. Murphy and Molly have settled in completely. They have been confident enought to come for cuddles on the sofa and settled into a a good routine. No accidents and are very comfortable using the litter tray... thanks to you! They love playing with us and play fighting with each other. They are a real joy to have around. Thank you for allowing us to take care of them. I have been singing the praises of Cats Protection to encourage others to be aware of the great work you all do"